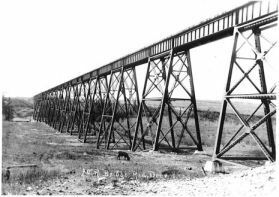 - 2,000 ft. long steel trestle by the Great Slave Lake Railway, operated and now owned by Canadian National Railways, built 1963 90 miles north of Peace River. Line sold to RailLink in 1998 and bought back in 2006. 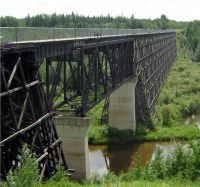 - (depending on side of river, referred to as the Beverly Bridge before Beverly traffic bridge opened in 1953) over North Saskatchewan River at east Edmonton, 1,655 ft. (504 m) long, 138 ft. (42 m) high; built 1907-08 iron and concrete truss by Grand Trunk Pacific; still in use by CNR as part of east-west main line. - 802' long and 98' high steel trestle built by Grand Trunk Pacific 1911, 6 towers of 50' long girder sections connected by 7-70' girder sections, abandoned 1916 with rail used for war effort and traffic using parallel Canadian Northern, rehabilitated 1927 after taken over by CNR; still in use by Canadian National main line to west coast and Via Rail. 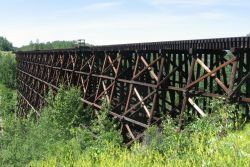 - active 590' CNR (formerly Northern Alberta Railways) steel trestle, 146' high. 11 short (45') plate girder spans and 115' deck truss, built 1916 by Central Canada Raiilway.